Taking the Sunday Bulletin home each week gives parishioners a chance to share their thoughts about the Mass with those around them. 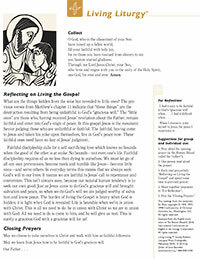 Families can reflect on the gospel reading together and share their own unique insight through group conversations. The Sunday Bulletin can be a reminder to keep God close to home all week long. Ready to be printed with your own important message. These provide the same content as the paper edition and are available at your fingertips in a downloadable PDF format.